You are at:Home»Coast Guard»Coasties make cameo in Mark Wahlberg's "Pain & Gain"
If Mark Wahlberg and Dwayne “The Rock” Johnson are not enough reason to draw you into the movie theater to see “Pain & Gain” — the top-grossing movie in America last weekend — how about the fact that several Coasties make cameos in the movie? As the good guys, of course. 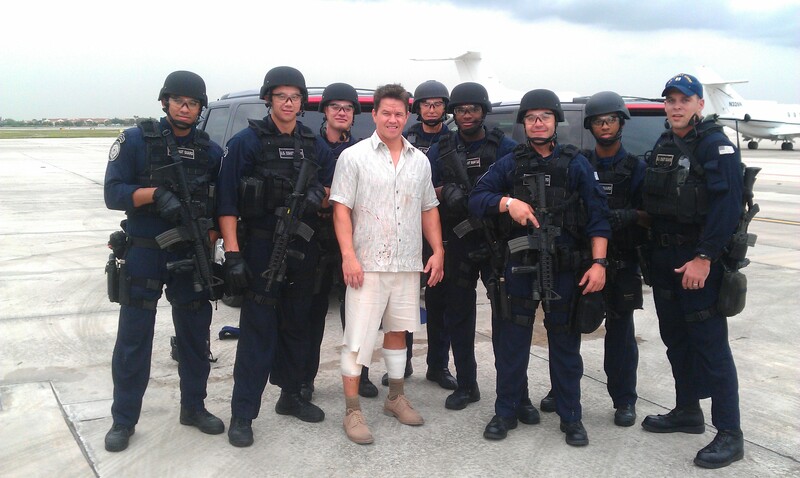 Coasties with a law enforcement detachment from Tactical Law Enforcement Team South, out of Opa-locka, Fla., had a chance to be extras in the movie and meet Marky Mark. On screen, the Coasties were the guys escorting Wahlberg from a helicopter to turn him over to Miami authorities, said Boatswain’s Mate 1st Class Peter Hutchison, one of the LEDET members who was an extra. “Pain & Gain,” based on a true story, follows a group of personal trainers who get drawn into crime, according to the movie’s website. The movie is based on a three-part series published in 1999 by the Miami New Times. The article, also titled “Pain & Gain,” tells the story of Daniel Lugo (played by Wahlberg) and other bodybuilders at Sun Gym who form a gang and resort to kidnapping, torture and murder. The Coasties’ role in the movie was to catch the bad guys and bring them to justice, Hutchison said. As part of the LEDET, the Coasties conduct counterdrug and counterpiracy interdictions, so their roles weren’t much of a stretch. The eight Coasties spent about half a day hanging out at the film site at Coast Guard Air Station Miami, Hutchison said. He said Wahlberg was a “down to earth, nice guy” who thanked the team for taking part in the movie, as did director Michael Bay. “The neatest part was the fact that they were just kind of normal, they didn’t have an air of celebrity around them,” he said. Hutchison, who is now stationed at Coast Guard Station Fort Lauderdale, added that getting the chance to represent the Coast Guard was a good experience.